Why You Need More Than One Source - George Stinney, Jr. - who is nicka smith? Why You Need More Than One Source – George Stinney, Jr.
Just because you have one high profile story or singular document noting a fact doesn’t mean that the journey is over. 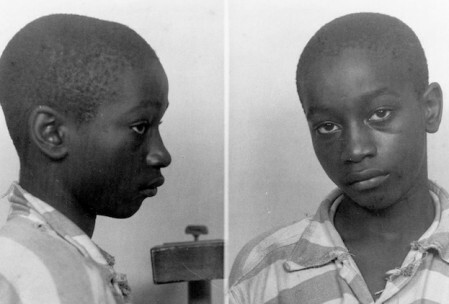 The name George Stinney, Jr. has been in the news lately since the state of South Carolina FINALLY decided to exonerate the 14 year old after he was wrongfully executed for murdering two girls in 1944. I’ve seen friends, geneabuds, family, and more eagerly sharing links to articles covering the story. As a family historian, genealogist, and history buff, I had more questions than what was just being provided on the surface about George. 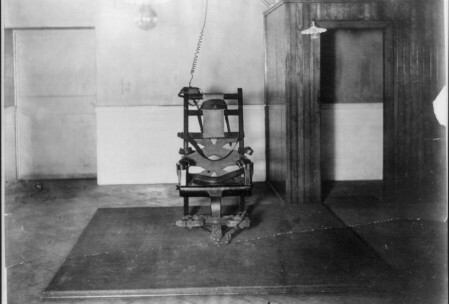 I knew there was more to this 14 year old than just the fact that he was the youngest person executed in U.S. history. I also saw this as a teaching opportunity. So, let’s take a virtual cab ride as to why researchers need to continue asking “So WHAT?! ?” (in the words of my geneabud Dr. Shelley Murphy) and and remind us all about why we need to do reasonable exhaustive searches. Do we KNOW that the “event date” is the death date when we haven’t seen the actual death certificate? Are we SURE the burial date is right unless they buried him in some state sponsored cemetery? Why is his father’s name listed but not his mother’s? Did the informant NOT know it? Who was the informant? Was his birthdate actually provided or was it just a year? George’s place of birth and residence are noted as Sumter County, SC although the crime and news reports have stated he was living in Alcolu, Clarendon, SC. Since I knew Ancestry.Com has South Carolina death certificates for a period including George’s date of death, I then pulled the actual death cert. Source Info: County of Death : Richland. Ancestry.com. South Carolina, Death Records, 1821-1960 [database on-line]. Provo, UT, USA: Ancestry.com Operations Inc, 2008. Original data: South Carolina. South Carolina death records. Columbia, SC, USA: South Carolina Department of Archives and History. OK, now we have an actual image of the death cert. A lot of folks would just stop here too, but we STILL have to go further. The event date IS the death date on the actual cert, but is this the case for all records like this that are indexed on FamilySearch or even on other websites? Couldn’t that term be easily confused for an indexer? The informant is NOT one of his parents or another elder…it’s “Himself when admitted to the penitentiary.” Imagine asking a 14 year old some of the information on this form during a normal day, forget when they’ve been admitted to prison for a crime they didn’t commit. I bet you 9 times out of 10 they wouldn’t know the info. His birth date, his parents places of birth and the name of his mother are “not given,” even though he was the informant. Who was his mother? The field noted as “Burial Date” on the index from FamilySearch is incorrectly noted. That was the removal date for the body. This was likely noted this way since there was no way for the indexer to distinguish between burial, cremation, or removal in the software they use. When you rely just on indexes, you don’t get this kind of granularity. George’s inmate number, #260, is noted by his name. This was not on the index. George Stinney, Sr., born about 1904 in South Carolina (George’s father) – We’ve now got two sources confirming this. George Stinney, Jr., born about 1930 in South Carolina – We’ve now got two sources confirming this. George Sr. worked at a saw mill and his wife Amie was a laundress. They were noted as living in the same house on April 1, 1935. It seems very possible that the family didn’t live in Alcolu very long by the time this horrible incident took place. The Washington Post story on George’s exoneration notes that his sister Amie was with him when the two young girls passed by. Based on this census information, Amie would have been about 7 years old when everything happened. George’s brother Charles also provided a written statement about George’s alibi. He would have been 13 years old when the crime took place. The 1930 Census tells a similar story. In the household with George Sr. and Amie (noted as Emmie) are an older sister of George’s named Carrie (born about 1925) and George Jr. who is 5/12 months old (born about October or November 1929) George Sr. and Amie are noted as being married about 1925. Since Carrie was not on the 1940 Census, I wonder if she died or if she was married since she would have been between 15-16 about that time. 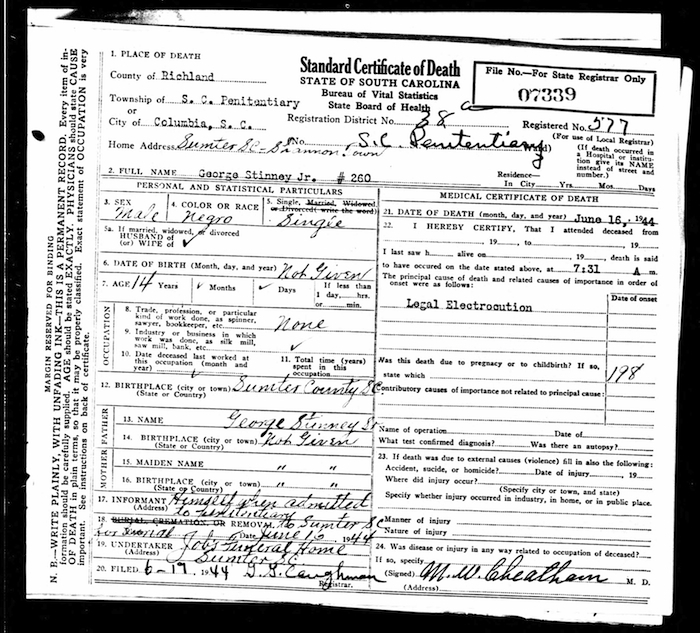 We’ve now got three pieces of info (death cert, 1920 census, 1930 census) stating that George was likely born in late 1929 or early 1930 and have nearly confirmed his birth place Sumter County, SC. 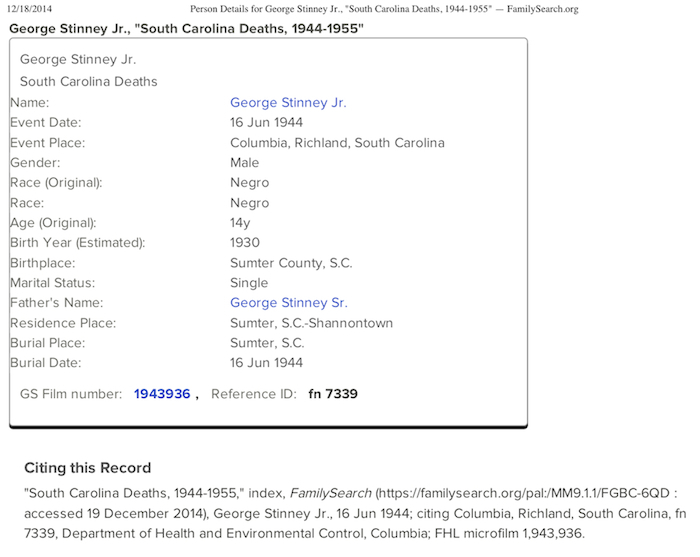 South Carolina Department of Archives and History, S108384: George Stinney Case Files, Clarendon County, Court of General Sessions, Indictment File of George Stinney. Series L14095, Indictment #1853. Autopsy Report. Accessed December 18, 2014. Based on a quick Google search, Lake Marion, which is located in Clarendon County, SC. was erected in 1941 as part of President Roosevelt’s New Deal. It’s very likely that George Sr. relocated the family to Alcolu due to newly created work in the area to support the largest lake in the state. Additionally, Clarendon County use to be part of Sumter County. We’re lucky to have both the indictment file and the record of prisoners awaiting execution file online for George. George is noticed as inmate #260 in the execution file. This number was referenced on his death cert. 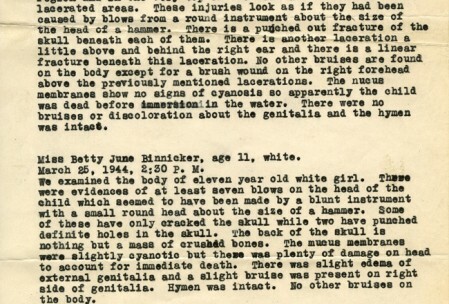 The official autopsy for Betty June Binnicker states “There was a slight edema [excess watery fluid] of external genitalia and a slight bruise was present on the right side of the of [the] genitalia.” This hints at the fact it was believed that George raped or molested at least Betty. This is something that is NOT being mentioned in news reports. There was a letter dated in 1964 requesting information on George’s execution from a researcher/student named Peter Johnson in Washington, DC that was answered by the then warden of the prison, R. Fuller Goodman. Goodman responded that information was scant on the execution but that he called sheriff of Clarendon County, SC for his “own information.” Goodman alluded to the possibility that Binnicker had been raped. George received correspondence from his father, George Sr., a brother, Leroy Stinney (of Holly Grove, NC), and uncle, Joseph Stinney (of Pinewood, SC) while he was awaiting execution (April 24, 1944 to June 16, 1944). If we had stopped at the death index, death cert, or census, we likely wouldn’t have found a notation of Leroy anywhere else. The same is true for Uncle Joseph. Outgoing mail to a “Mr. S.P. Revell” living at 2605 Evergreen Avenue in Jacksonville, FL. The jury is still out on exactly who this is and why George had correspondence with them. A witness named George Burke was listed but his name scratched out both indictments for murder. I uncovered two George Burke’s living in Clarendon County, SC. on the 1940 Census. Both were white. There is no indication why either of them was not chosen to be a witness with H.B. Newman and Ben Alderman. 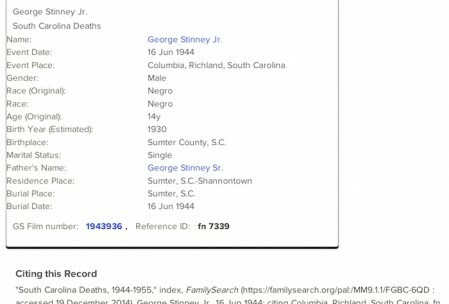 The record of electrocution notes that George completed 7th grade, he can read and write, and that his residence is in Sumter County, SC, not Alcolu. News reports state that George’s family moved from Alcolu once the trial took place, so it’s possible they went back to Sumter. It also notes that his body was transferred from Columbia, Richland, SC to Sumter County, SC (nearly 44 miles) for burial at the request of his father. His burial location was TBD. If we had stopped at the index, we would have assumed that George was buried on the same day he was electrocuted and this is not the case. While the search I did was indeed not exhaustive, and didn’t include any offline records, interviews, etc. (I could keep going LOL), it definitely proved that you can’t just go by surface information when you read news events and especially when you are researching your family. I am eager to see what you can find to add to George’s story. While his life was indeed too short, it doesn’t mean that his story and the lessons we can learn from his genealogy are any less valuable.